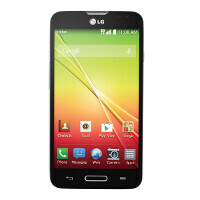 The LG L70 will be available for Cricket subscribers starting on Friday. The handset will be available from the pre-paid operator for $49.99, with a $50 mail-in-rebate. Those receiving the $50 rebate will get it in the form of a Cricket Visa Promotion Card. The device offers up a 4.5 inch screen with a 480 x 800 resolution. A dual-core 1.2GHz processor is under the hood, driving the phone. 1GB of RAM is on board, along with 4GB of native storage. That obviously is not enough memory, so a 32GB capacity microSD slot is included. The back and front-facing snappers are 5MP and .3MP respectively, and the whole shebang is powered by a 2100mAh battery. Android 4.4 is pre-installed and the phone offers 4G connectivity via HSPA+. The LG L70 also includes some of LG's own features such as Quick Knock. This allows you to set up a pattern of 3 to 8 taps that will unlock the handset. With Quick Memo, you can write or draw (using your finger) over any screen capture. Then, you can send it to your friends or family via email, text or a social network. Quick Slide 2.0 is the way you can run two apps at the same time on LG models. The two apps are open and are active on top of each other. Using a slider, you decide which app will appear, and which app is in the background. And, Informative LED uses a pattern made by a blinking LED light to alert you to a missed call and other features, without having to wake up the phone. In the aftermath of its purchase of Cricket parent Leap Wireless, AT&T has relaunched 3000 Cricket Wireless stores across the nation. Cricket offers service for as low as $35 a month (after a $5 credit for using Auto Pay). After 12 months of on-time payments, customers receive a $50 credit toward a phone purchase. Is it with or after the $50 rebate? If it's with it means the phone would be free, if not then it's $49.99. The headline says it's after the rebate, though the article just says with a rebate. I wouldn't think this phone would be free, as it isn't really a low-tier phone. Not that impressive in terms of specs, but it does have 4.4 out of the box, so it is ahead of most other cheap phones in its class. Good option on Cricket instead of a Moto G considering the lower cost, upgradable memory, and removable battery.